take care of this moment. : New Year, New Ambitions. On the 10 hour car ride home yesterday I had time to think, reflect, and write down a few of my goals for the coming year. I had a chance to think of ways to simplify our lives. I love this time of year, it gives me a chance to reacess, renew & reorganize my goals [and add new ones!]. At the top of my list is always organization and ways to teach my children all sorts of things including responsibility, academics, service, the gospel, etc. I came across a site that I love and will be a frequent visitor to. I love the 10 random sites that include fun calendars to print, this great Book of Mormon study site I have never seen before. You've got to visit this and see the fun ideas for your kids to celebrate New Year's. This is a great tool to use for your CD you'll receive for the new 2008 Primary Theme. Great ideas and charts to organize your little ones. A fun way to excercise your brain [and remember 3rd grade geography!]. Lots of great LDS coloring pages for sacrament, FHE or whenever. I love giving and receiving new ideas so if you have any please share! I am creating for each of my kids a Journal for 2008. It is based on Pres. Eyring's talk this past Conference regarding keeping a journal entitled 'O Remember, Remember' What an inspiration to me to give my children this gift. To go along with this journal [which I am planning to take place on Sunday evenings] I have found a wonderful outline for us to follow, it is called Ponder and Do for 6 months of 2008. Each sparks a thought for your child to either write or draw about the theme or scripture for the week. We are having the kids decorate the journals and putting lettering that says "I am grateful I am a child of God." We want them to remember ways Heavenly Father has blessed them, so they learn to recognize how much Heavenly Father loves them. Happy New Year! 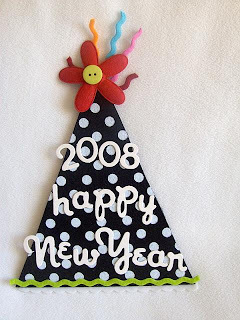 2008 is almost here---get going on your list! You are truly an inspiration. I love to read what ever it is you have to say! thanks for all the links! You are definitely more ambitious than I am! Oh - and I saw your dad's business card somewhere in SG, I didn't know he was a realtor, I bet he is so good at it! I always remember how friendly he was/is! I love your blog so much. I was just telling Mike this morning while we were out celebrating our anniversary that we needed to add YOU to our blog links! We were on the same wave length! I was also talking up your blog last night when I talked to Jessica. I pleaded with her to start a blog! I think she would love it! Hope you have a Happy New Year. Thanks for all your great ideas! I have also used this website for sharing time in Primary. Thanks for posting all those awesome links and ideas! I had just ordered the book of mormon discovery cd from that website you posted before I came to your blog - what a coincidence! :) I may have to steal your journal idea.. but only one of my kids can really write or draw.. hmm.. You are so fun and talented! My sister just told me about this web site while we were in Utah. I can't wait to look at it.